Many of my dishes call for chopped garlic, but I really dread chopping it. It seems like its pungent odor gets into the skin of my fingers, under my finger nails, and lingers for much longer than I care to be reminded of it. I have several garlic presses, but none of them really stand up to my expectations, since I am striving to minimize the garlic handling time as much as possible. As you would probably agree, from viewing the attached pictures, it is very simply constructed, but works wonderfully. 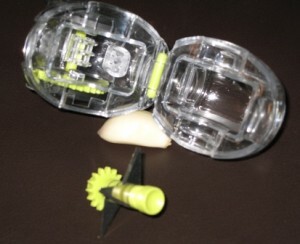 The main part opens up at the top, to feed the garlic cloves into the chopper. 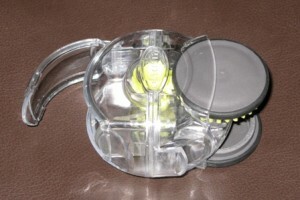 It also opens into two halves, at the middle, for easy removal of the final product, and for blade removal for cleaning. Rub it back and forth several times, until finely chopped garlic fills the cavity of the chopper. I was so pleased with the results of this gadget (and it’s priced under $10), that I went back and purchased several more units, for my friends and family. If you are not pleased with your present garlic press/masher/chopper, this one will win you over!!! I love to add garlic to my cooking but I hate how it makes my hands smell. This looks like the perfect solution. Chopping garlic could never be easier, thanks to Chef’n Garlic Zoom. It’s fun to operate. Easy to clean. Compact enough for easy storage.